How Much Loss Will Investors Stomach? Lyft finally made its highly anticipated debut on the Nasdaq this past Friday. It debuted by selling shares at $72 apiece (a $24 billion valuation), which was on the higher end of the range the company provided before the offering. Share prices jumped about 21% higher to $87 in early trading but ended the day around $78. 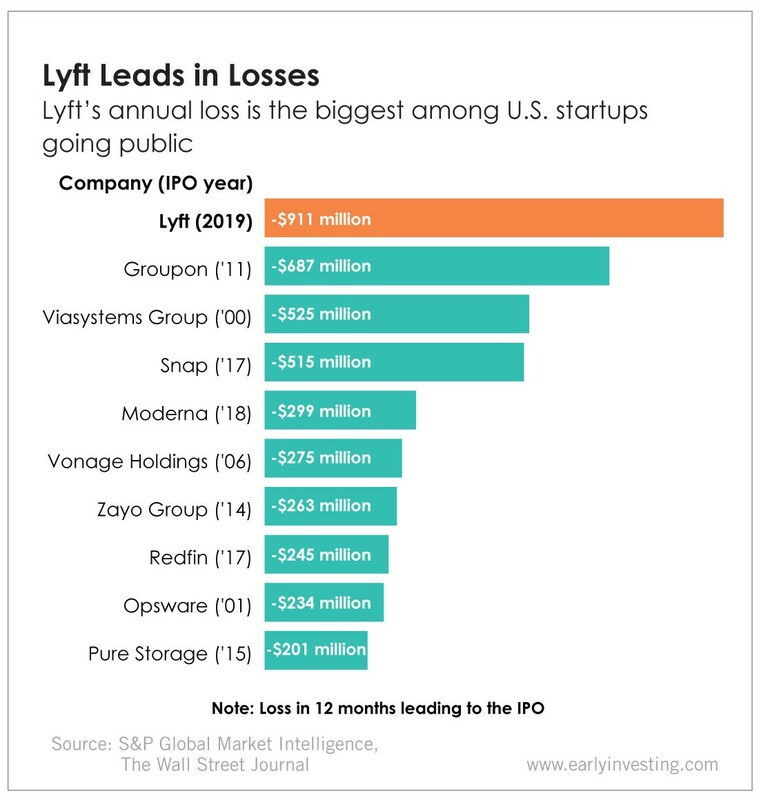 What’s more interesting than the actual IPO is the way Lyft is potentially heralding in a new era, one where highly valued startups test investors’ stomachs for big losses while they keep pushing for growth. And big is an understatement. As today’s chart shows, Lyft’s annual loss – $911 million – is the largest among U.S. startups going public. Lyft co-founder John Zimmer told CNBC they used certain metrics to justify its valuation. “What investors are looking at is revenue multiples over the next few years. And that’s giving them confidence in the long-term value of the company,” Zimmer said. In our case, I think what we’ve seen in talking to investors [is] that more people are maybe surprised to see the numbers that we’re putting out, and I think this is a great part of the process. For us this wasn’t the goal – this is a milestone along the way – but we feel like it helps us with additional access to capital. Lyft might be onto something. Lyft’s losses didn’t dampen the high of its IPO day. And investors seem to have an appetite for highly valued startups making little to no profit in general – Uber, WeWork and Palantir Technologies are also expected to IPO this year with big valuations and no profits (and possibly huge losses). It will be interesting to see whether investors will keep running toward the IPOs still to come. Here at Early Investing, we’re definitely keeping an eye on these IPOs. But personally, we’d rather get in long before the hype. That’s where the real growth and value is.